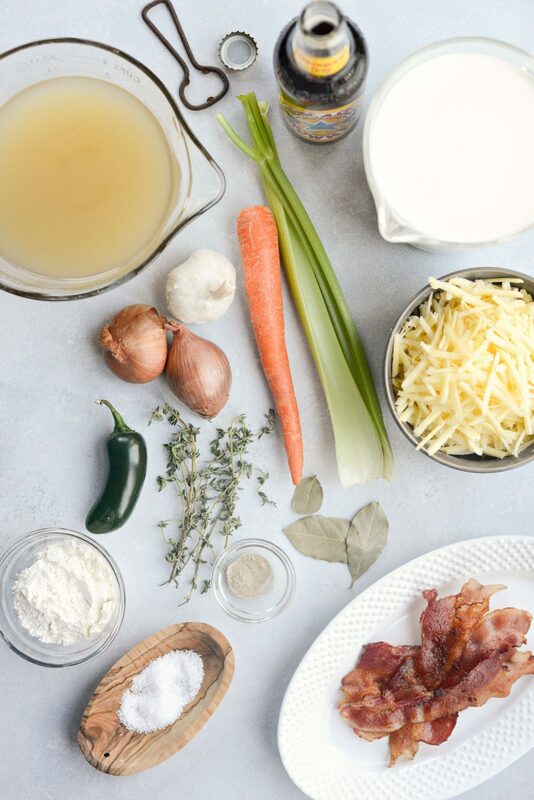 In this Irish Cheddar Beer Soup, vegetables are sautéed in bacon fat and cooked in beer, broth and half & half and then combined with creamy Irish cheddar cheese. 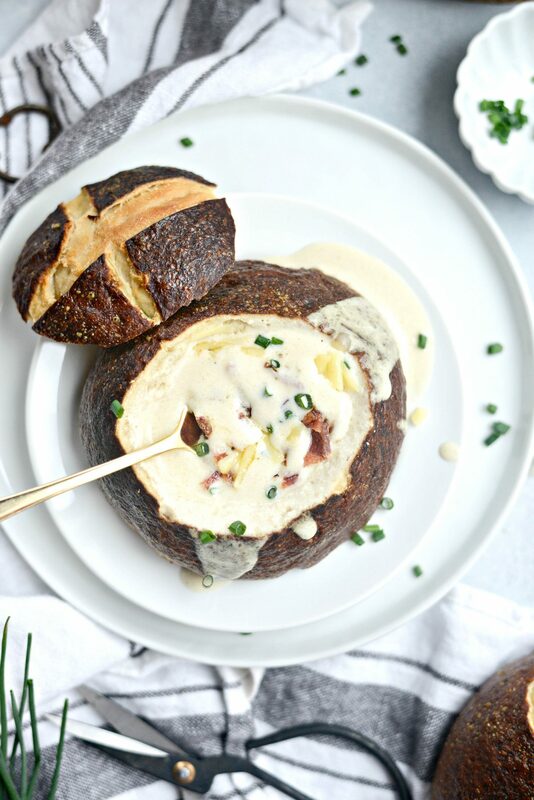 Homemade pretzel bread bowl, optional. Topped with chopped bacon, chives and more cheese. Serves 8 in around an hour. My home smells like beer. And cheese…and pretzel bread. This has to be what heaven smells like, right? 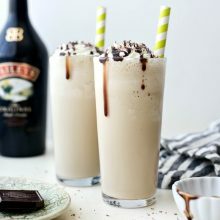 I hope it is because this combo is mouth watering good. 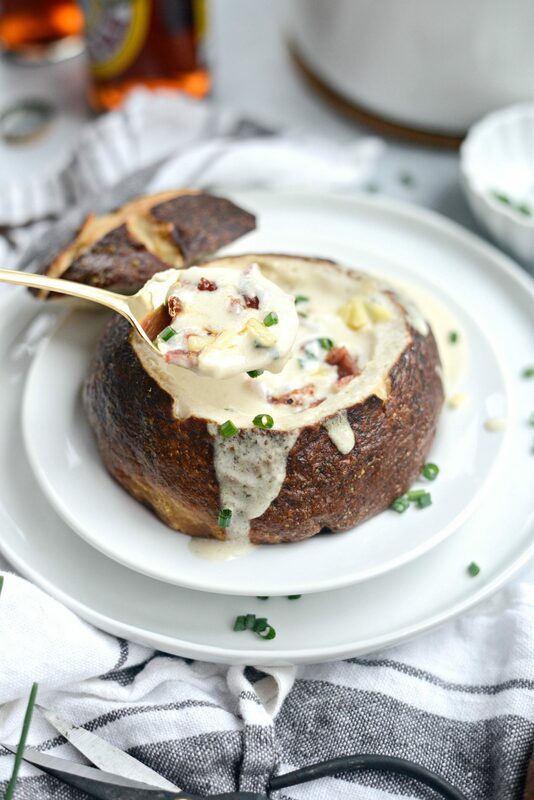 There’s something about soup in a bread bowl that is so beloved. Whenever my girls and I go to Panera, Malloree always orders broccoli and cheddar soup in a bread bowl. She also orders a grilled cheese, oh to have a 13-year-olds metabolism. 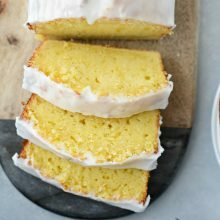 Her order is what inspired today’s post. 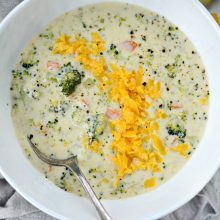 I just swapped out the broccoli and cheddar (although that would be delicious too) for Irish cheddar beer soup – you know for St. Patrick’s Day and all. 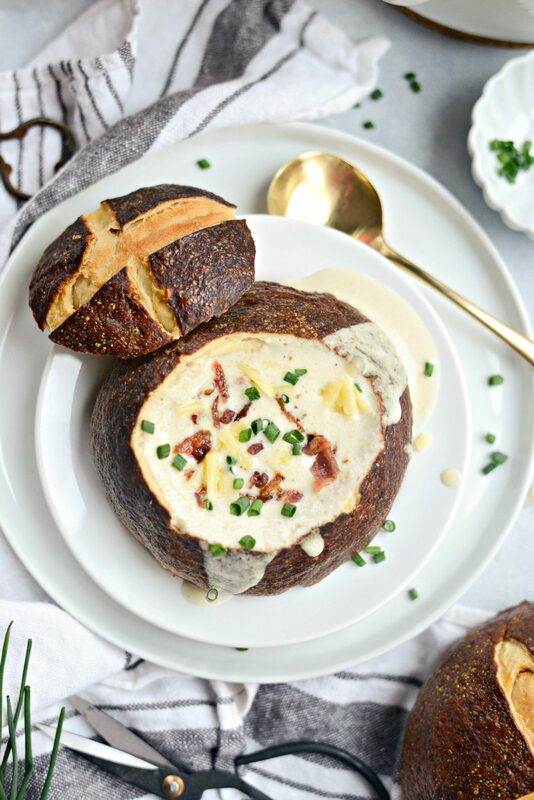 This soup, the bacon, THE CHEESE and the bread bowls together, is utterly delicious. Creamy and flavorful…undertones of ale, jalapeño and sweet and creamy Irish white cheddar. I could’ve drank this soup it if it wasn’t so much more delicious in a bread bowl. 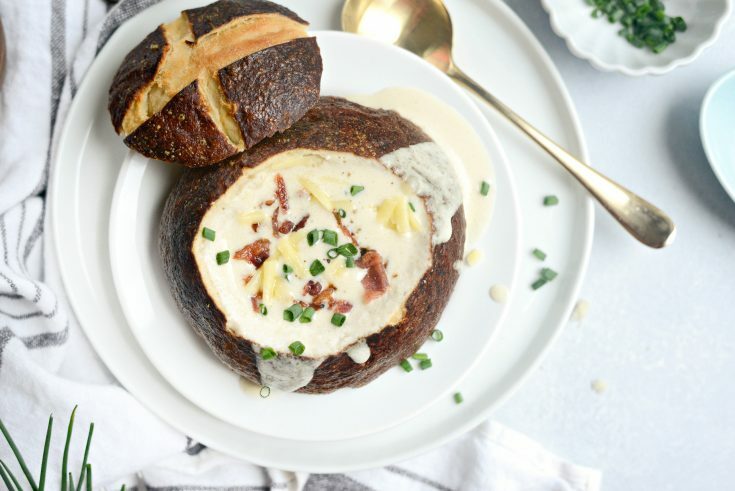 Pretzel bread bowls to be exact. 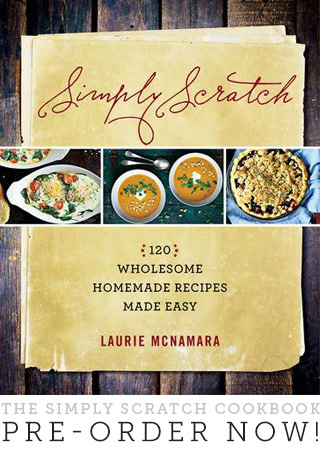 For this soup you will need, cooked bacon (keep the fat! ), celery, carrot and shallots, jalapeño, garlic, flour, beer (ale preferably), low-sodium chicken broth, half & half, fresh thyme, bay leaves, Irish white cheddar cheese, salt and white pepper. In a dutch oven, cook the bacon on medium-low heat until crisp. 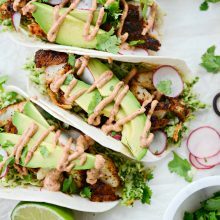 Remove to a paper towel lined plate and set aside. Once it has cooled, give it a chop. 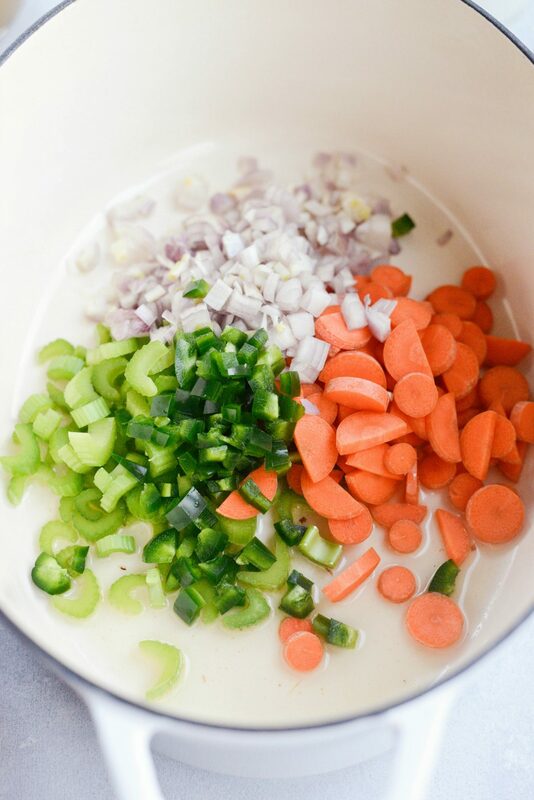 To the bacon drippings, 1 cup diced sauté the shallots, 2/3 cup each carrot and celery and 1 medium jalapeno. Keep some of the seeds and ribs intact for some heat. 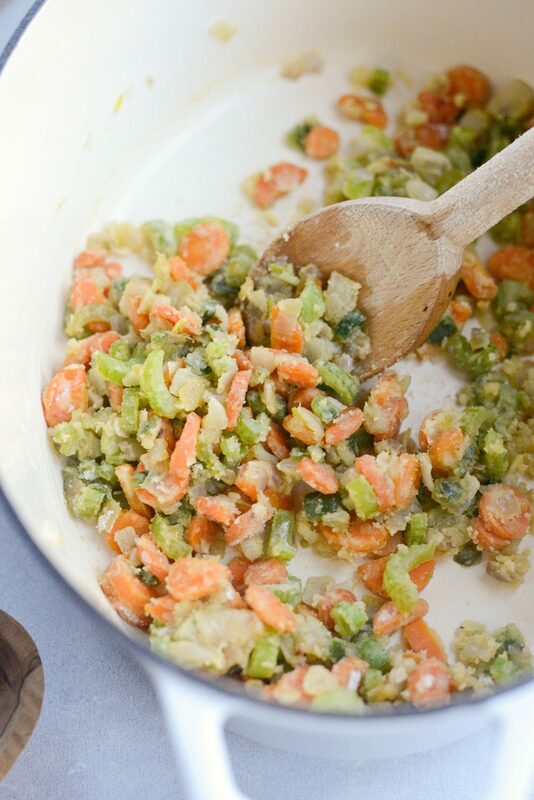 Once the vegetables are tender, add in the 3 cloves of peeled garlic and cook for 1 to 2 minutes. Then sprinkle in 1/3 cup of flour, stir and cook for 2 minutes or so. 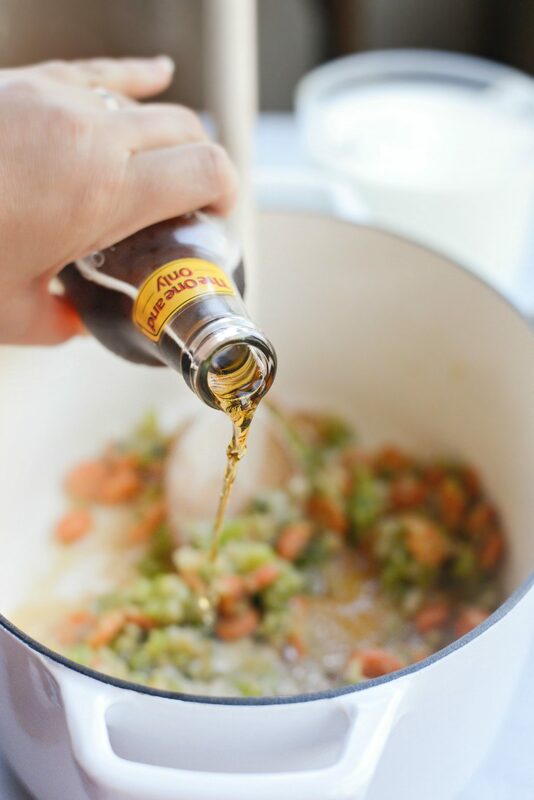 Slowly pour in the 12 ounce bottle of [ale] beer, while scraping any browned bits from the bottom of the pot. I couldn’t find an Irish ale at my grocery store, but if you are lucky and can score some, use it! 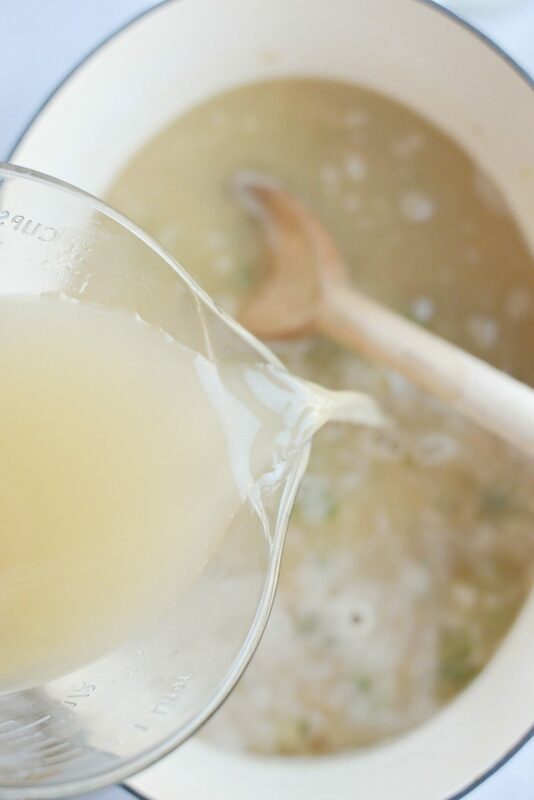 Then pour in the 3 cups of low-sodium chicken broth and 4 cups half & half. Stir, cover and bring to a simmer. 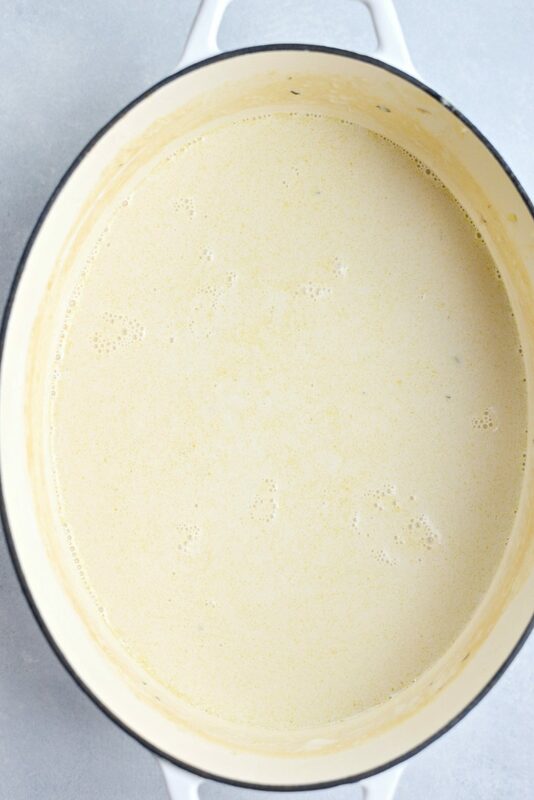 Crack the lid and let simmer for 30 to 40 minutes or until the soup has thickened up some, stirring occasionally. 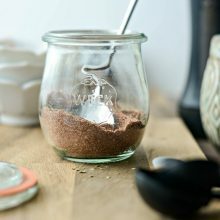 Set a fine mesh strainer or colander into a large 8+ cup bowl. Slowly pour the soup through the strainer to catch the vegetables. Alternatively, if you want to leave the soup with the veggies, skip this step and just fish out the bay leaves and thyme stems. 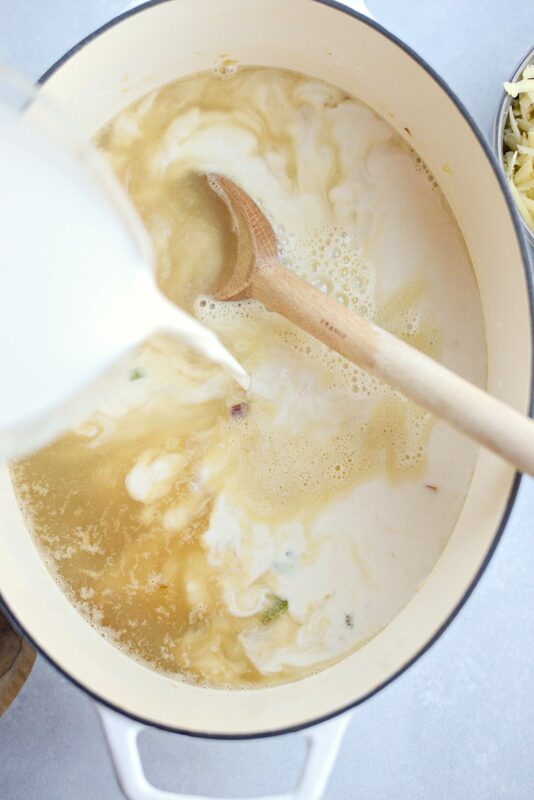 Pour the strained soup back into the original Dutch oven and add in 1-1/2 cups of Irish white cheddar cheese. Stir until blended and season with 1 teaspoon kosher salt (more or less to taste) and 1/2 teaspoon of white pepper. Reheat on low heat, do not reboil or it you could risk it separating. 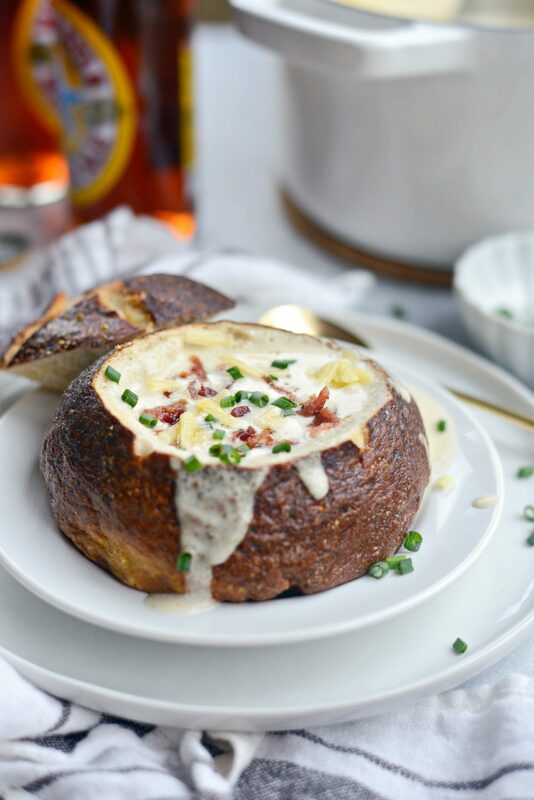 Ladle the Irish cheddar beer soup into bowls -or bread bowls- and serve with reserved chopped bacon, snipped chives and a little extra cheddar on top. 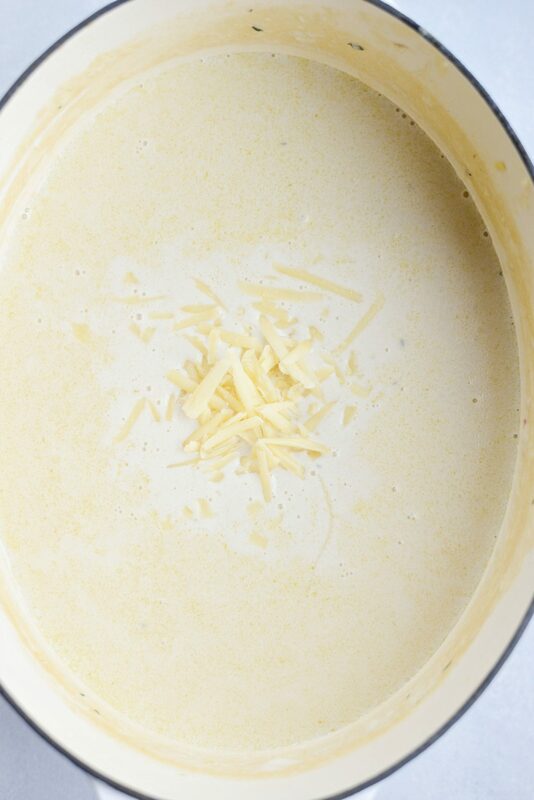 Not too overly powered by the beer or the cheddar, just a creamy, flavorful soup that will warm you up on a chilly night. In your Dutch oven, cook bacon over medium to medium-low heat until crispy. Transfer the cooked back to a paper towel lined plate to drain, then chop. 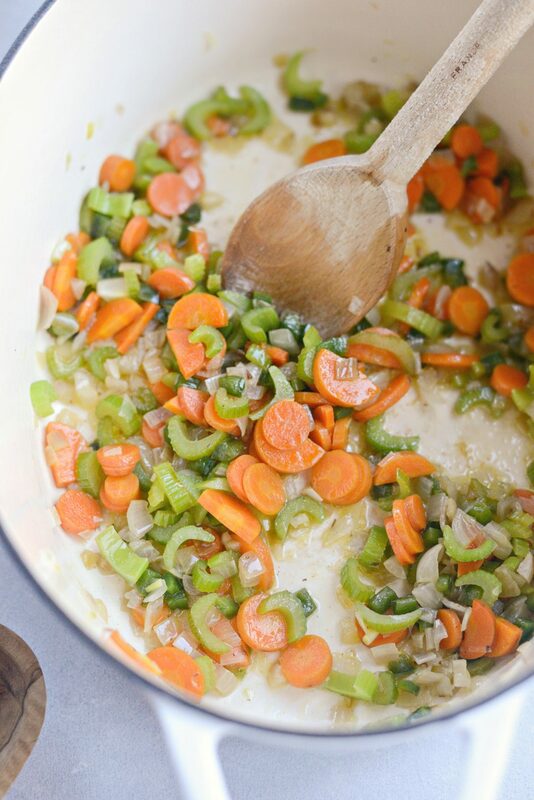 To the bacon fat, add the shallots,carrots, celery and jalapeno. Season with a pinch of salt and cook, covered, until fork tender. About 10 to 12 minutes. Next add in the garlic and cook 1 to 2 minutes before stirring in the flour. 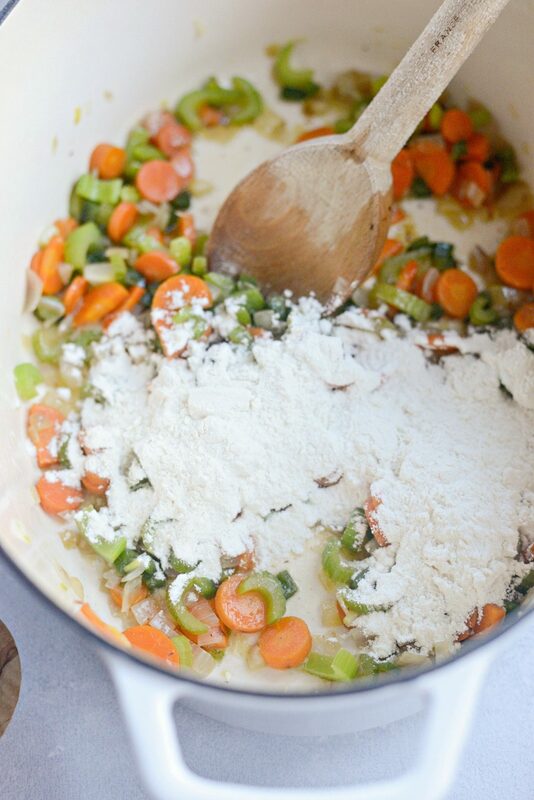 Cook the flour mixture, stirring often for 2 minutes. Continue stirring while slowly pouring in the beer. Then pour in the chicken broth and half & half. Stir to combine, add in the thyme sprigs and bay leaves. 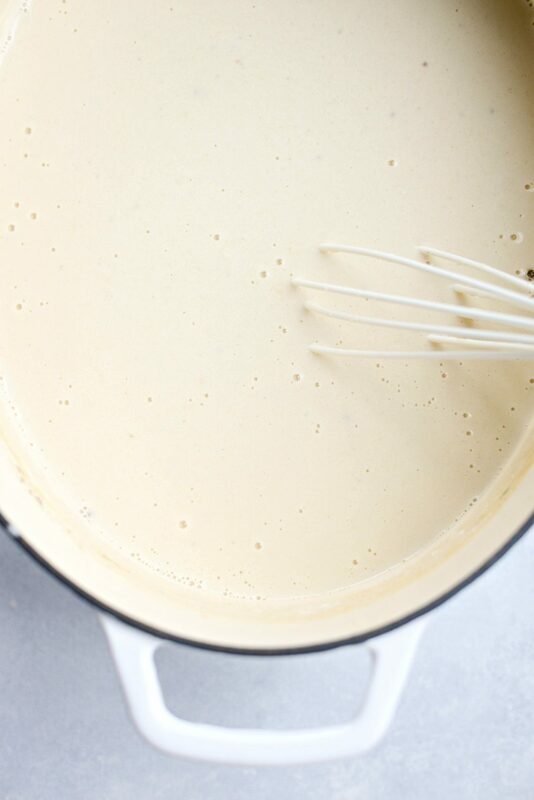 With the cover askew, bring to a low boil then reduce the heat to medium-low and simmer the soup for 30 minutes or until thickened, stirring occasionally. 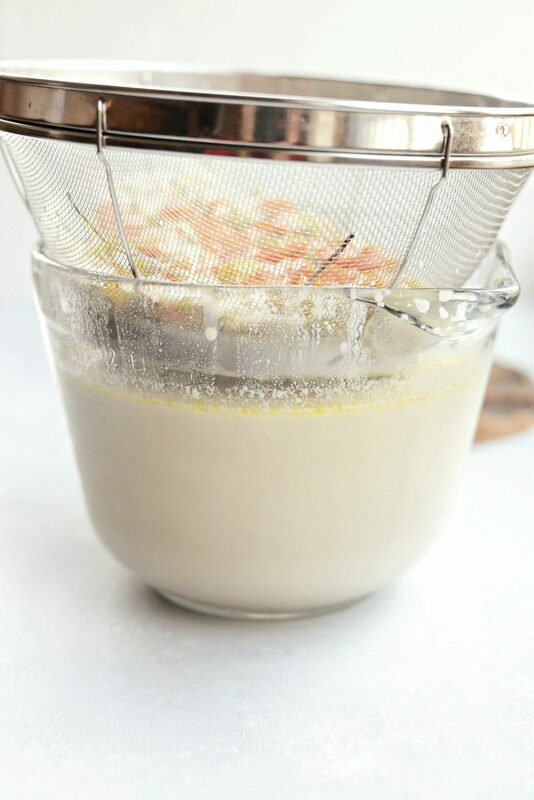 **Strain the soup through a fine mesh strainer into a clean pot or bowl with a spout, and transfer the soup back into the warm dutch oven. 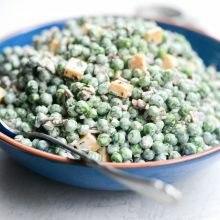 Stir in 1-1/2 cups of Irish white cheddar and season to with 1 teaspoon kosher salt and 1/2 teaspoon white pepper, or to taste. Reheat on low heat, do not reboil or it you could risk it separating. 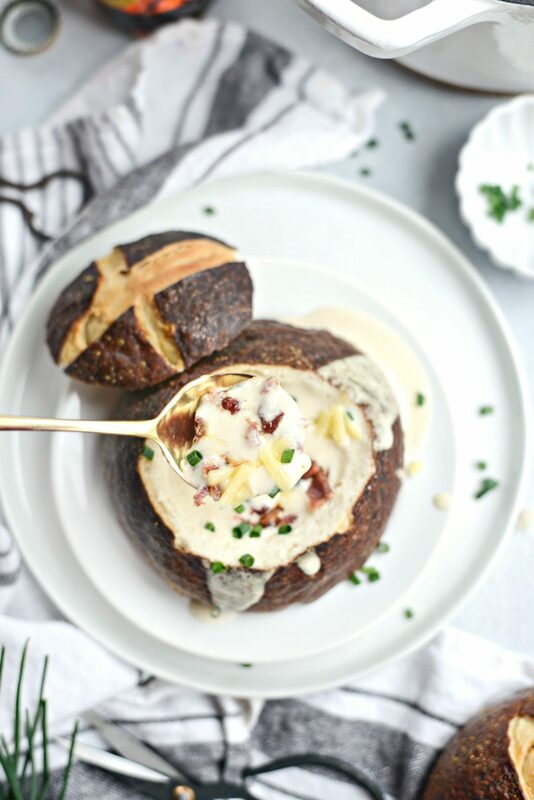 Ladle soup into bowls or bread bowls and top with extra cheese, chopped bacon and chives.